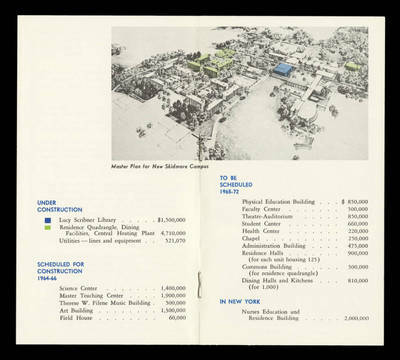 Includes a graphic rendition of the "Master plan for New Skidmore campus", highlighting the Lucy Scribner Library and residence quadrangle, dining facilities, and central heating plant. With estimated costs of buildings under or scheduled for construction. 1 pamphlet, ( p.) : ill., map ; 16 x 9 cm.